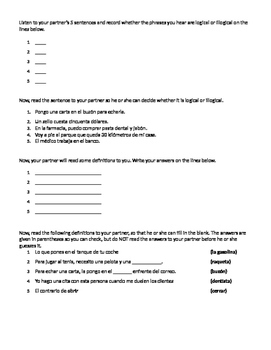 This partnered speaking activity incorporates the Realidades 2, Ch. 3A vocabulary (errands, sporting equipment, toiletries, etc.) and gets every kid in the class speaking! Students get in pairs; one gets the "Estudiante A" script and one gets the "Estudiante B" script. Student A starts by reading five sentences, some of which are logical and some of which are illogical. Student B listens and records his opinions on the statements. Then the roles are reversed; Student B reads his sentences, while student A decides if they're logical or illogical. Next, Student A asks five short answer questions aloud, the answers to which are all 3A vocab words. Student B writes what they think the answers should be. Then repeat the process, vice-versa. Takes about 15 minutes between the speaking and going over the answers. Even the shy students seem to love participating in this! They are listening, reading, and writing in Spanish all at the same time.